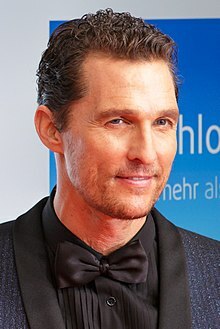 Matthew David McConaughey (born November 4, 1969 in Uvalde, Texas) is an American actor. McConaughey made his big screen debut in the 1993 movie My Boyfriend's Back. He received great claim for his role as Mud in the 2012 movie Mud. This page was last changed on 20 February 2018, at 23:10.